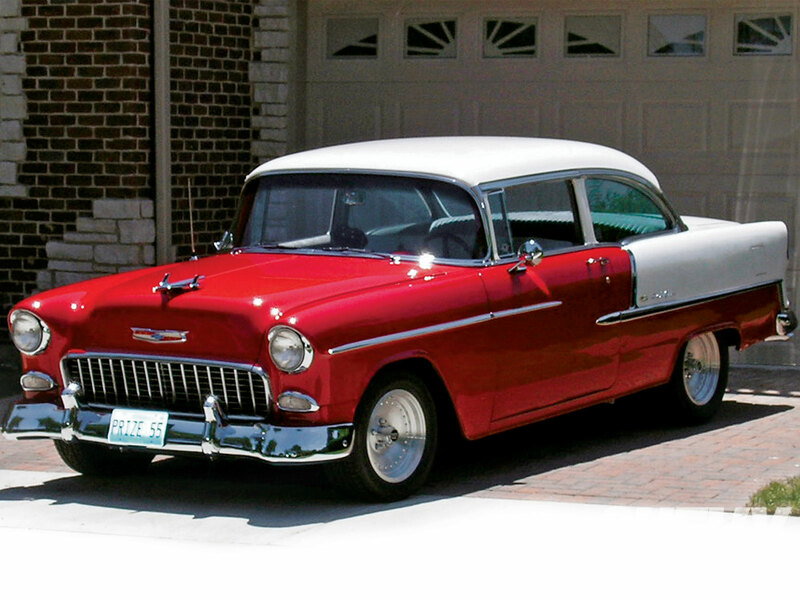 Home » Contributor » The 1955 Chevy Bel Air: The World’s Most All-time Popular Car? The 1955 Chevy Bel Air: The World’s Most All-time Popular Car? To begin, the 1955 Chevrolet Bel Air has been featured in hundreds of Hollywood films. Here’s an example: it was in American Graffiti. Harrison Ford made his screen debut driving a black 1955 Chevy in this movie. This was what challenged John Milner (Paul Lemat) in his interesting yellow 1932 Ford 5 window coupe. We are telling you we believe that the 1955 Chevy Bel Air was the most popular car ever made. One of the reasons 1955 Chevy’s remarkable popularity in the media was that General Motors sold plenty of them, over 3 million. This was likely because it had a powerful new V8 engine and a fresh new body design. First, let’s consider the body redesign. Although Ford had already went to a “shoe box” body design (without external fenders) in the late 1940s, Chevy was slowly starting to do the same thing through the early 1950s. In 1955, Chevy bit the bullet and caught up with Ford by heading towards a true shoebox look. This appearance involved smooth straight panels on the sides and hood, triangular tail lights that jutted outward and wrap-around glass on the windshield. According to the Sales Manager at Lynch Chevrolet of Mukwonago, a full-service Chevy car dealer in Mukwonago, WI, the motoring public went nuts over this new look. The next characteristic that was a big hit was the available V8 engine. Chevrolet had made an earlier car with a V8 in 1918 but it stayed in production for only a year. The new 265-cubic-inch overhead valve V8 for the 1955 model year was a design that was an enormous hit. This engine was designed to be lighter, smaller, and more powerful than any other V8s in the car industry at the time. The 1955 model year was also a year for other Chevrolet firsts. Never before had so many options been available for this car with an affordable price. These options included changing from an antiquated 6-volt system to a 12-volt and the introduction of many new options like air conditioning, power windows, power seats, power brakes and power steering. Chevrolet kept the similar chassis and body style for the 1955, 56, and 57 model years. Today, these years are sought after by enthusiasts and collectors, and are often referred to by the nickname of “tri-fives.” All three years are really sought nowadays after but the 1955 stands as the original and most popular of the series. Poll some car buffs and you will likely find a consensus on the following fact: the 1955 Chevy is the most recognizable car ever made. We hope that you have enjoyed learning about this classic car!